I am so angry right now. Would you like to know why? It’s because I loved Fairy Metal Thunder! Now I have to wait until December to read more of the story (That’s when Fairy Blues comes out). In case you didn’t know this, I hate waiting. Fairy Metal Thunder took me back to my childhood when I had great dreams of marrying a certain goblin king, yep I had big plans for David Bowie and I. Childhood dreams aside, Fairy Metal Thunder has the same feel that the movie Labyrinth has, this wondrous fantasy world that you’re desperate to have at least a small part of, even to the point of stealing. Jason is babysitting his little sister when she complains about a monster being in their parents room. When Jason investigates he finds a little green something steeling his mothers jewelry. Jason chases after the monster (Who is Grizlemor a goblin.) and that is how he finds his way into the Fairy world. While he’s there he steals instruments that will help his band. I really liked Jason's character. He tries to make everyone happy, I don’t think it’s that he’s a push over he’s just a teenager. Grizlemor returns to our world after Jason has stolen the fairy instruments to hide from the queen since he is the one that led Jason down in the first place. Grizlemor now lives in Jason’s room with him. I thought this was a fun turn of events as Grizlemor is super disgusting, never bathes, and has Jason bring him horrible things to eat like “Whipped cream and Spam on rye”. I guess that’s the kind of roommate you end up with when you steal from fairies. Bryan has this way of writing that is so descriptive that I would almost forget I was reading and just watch everything unfold before my eyes. I love being able to see what I’m reading especially when there are so many fantasy elements in the story, and that’s what I got in Fairy Metal Thunder. From the music to the creatures it was all laid out perfectly. speaking of creatures there is one in particular I want to talk about, Buttercake. Buttercake is a unicorn. Unicorns are used sort of like blood hounds in this book and their around the same size…well most of the time. After reading Fairy Metal Thunder I want my own Buttercake! To the point that I’m willing to create a sugar cane swamp in my back yard and everything, I wonder what my chances are of getting an actual unicorn here are? I loved Fairy Metal Thunder and I am so excited to read more in the Songs of Magic series. The next in the series is Fairy Blues and is due out in December. But why are you still here? 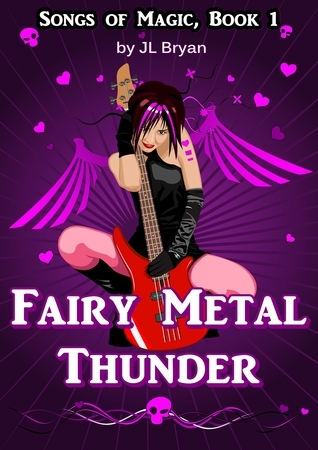 Fairy Metal Thunder is just $0.99 for the eBook version. Go get a copy and start reading! 12 and up: There is light kissing, and a small bit of dragon violence. I like the entire premise of this book, it sounds so clever! Fairy instruments? That's awesome! Great review! Oh great! I was wondering if this was good it sounded really interesting. I really like when the author gives enough detail to really imagine the story and see it unfolding. I'll be sure to read this one! Great review, Rebecca! LOL - I know exactly what you mean about having to wait for book 2. One of the reasons I wait to start reading series' till book two is out.